New Press, The, 9781595581884, 176pp. The Runner tells the remarkable true story of a drifter and petty thief named James Hogue who woke up one cold winter morning in a storage shed in Utah and decided to start his life anew. Reimagining himself as a self-educated ranch hand named Alexi Indris-Santana who read Plato under the stars and could run a mile in under four minutes, Hogue applied and was accepted to Princeton University, where he excelled academically, made the track team, and became a member of the elite Ivy Club. Echoing both The Great Gatsby and The Talented Mr. Ripley, the story of Hogue’s life before and after he went to Princeton is both an immensely affecting portrait of a dreamer and a striking indictment of the Ivy League "meritocracy" to which Hogue wanted so badly to belong. Beginning with the end of Hogue’s career as a thief in Telluride, Colorado, The Runner takes readers back in time to uncover the true story of Hogue’s life based on an unlikely trove of documents and the firsthand accounts of those who encountered the many colorful personalities the gifted liar, dreamer, and athlete had made up as he went along. 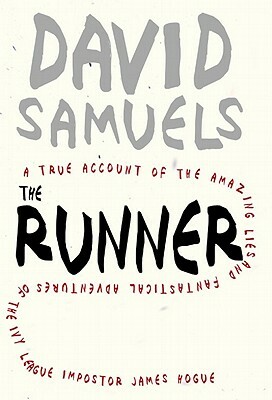 The Runner is an extraordinary personal story and an absurdist parable of the Ivy League admissions game. It is also a deeply felt exploration of the slippery nature of personal identity in America. Drawing elegant parallels between Hogue’s ambitions and the American myth of self-invention, while also examining his own uneasy identification with his troubled subject, author David Samuels has fashioned a powerful metaphor for the corruptions of the American dream, revealing his exceptional gifts as a reporter and as a literary stylist.